On Saturday night before the X Factor final on ITV, we got see more of Cheryl Cole on her one-off show “Cheryl’s Night In”. She was still fighting for this love wearing her favourite Alexander Wang boots, she’d worn in her first performance on the X Factor a few weeks ago. This time she swapped the military outfit for a pink ninja-style look. My favourite look of the show as when Cheryl perform “3 Words” a duet with Black Eyed Peas rapper Will.I.Am. She looked stunning wearing a her 3rd look from the Stéphane Rolland Fall 2009 Couture collection this year. This black gown with a sheer yoke had a dramatic train which Cheryl used to full effect during her performance. Last season Cheryl wore a pink Krystof Strozyna dress on the X Factor, so it wasn’t a surprise to see her wearing the same designer again. Whilst Cheryl was being interviewed by Holly Willoughby wearing a teal Temperley London gown, Cheryl glowed in an orange and black Krystof Strozyna Spring 2010 pencil dress. This digital print dress has geometric fabric panels which I absolutely loved. Love her or loathe her, she’s given us some interesting fashion choices this year. 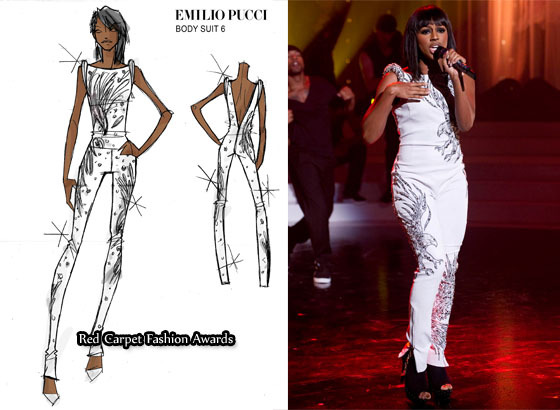 Alexandra Burke has worn many Emilio Pucci pieces. When she performed her hit single “Bad Boys” on “Cheryl’s Night In”, she wore an exclusive ‘one-of-a-kind’ outfit designed by Emilio Pucci’s Creative Director Peter Dundas. The white two piece was covered in studded eagle motif, which sparkled as she performed her energetic dance routine. A big wow for Alexandra who after one year in showbiz already has big name designers making looks especially for her.